2 oz. 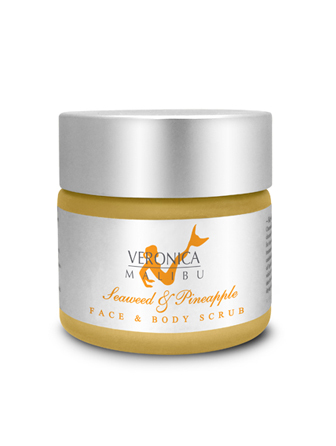 – The Seaweed & Pineapple Scrub is an effective exfoliating, retexturizing, refining, and nourishing treatment scrub. Efficient and non-abrasive exfoliating is achieved by the combination of Bromelain enzymes (Pineapple) and the action of Jojoba beads. The enzyme helps to effectively remove excess surface cells, while the micro spherical jojoba beads dissolve and release their nourishing jojoba oil into the skin. This process produces improved skin texture and leaves the skin with a luminous glow. The ultimate result is refined and moisturized skin. Chamomile, Pineapple, Papaya and Seaweed leave your skin moisturized and cleansed without drying it out. Gentle scrub designed for frequent use. Deionized Water, Aloe Vera Gel, Glycerin, Seaweed Extract (Laminaria Digitata), Hydrogenated Jojoba Oil, Chamomile Extract, Hydroxypropyl Methylcellulose, Carbomer, Sodium PCA, Papaya Extract, Pineapple Extract, Bromelain Enzymes and Papain Enzymes and Lecithin, Triethanolamine, Plysorbate 20, Phenoxyethanol, Sodium Benzoate. After cleansing, apply a small amount (dime size) to wet face, and scoop (silver dollar size) to wet body. Massage in circular motions. Rinse thoroughly, then follow with a moisturizer. Use once to twice weekly.